3D Support – With 3D movies going big time these days, Apple plans on patching the iPhone to allow users to experience 3D on their handset while wearing stereoscopic glasses. Multitasking – The second most persistent rumor is multitasking for applications. As it stands the iPhone OS is not the best at multi-tasking, and users are mad as hell. 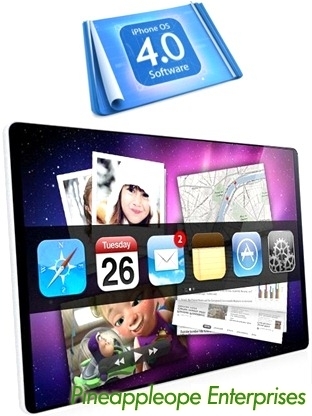 Newest rumors have the new OS having an Exposé-like feature which would make the iPhone easy to use and a multi-tasker. 4 Way Phone Calls – Easily one of the most demanded features, the ability to talk to three others at the same time. Great for business meetings and for calling Quest. One Email Box – Users have been clamoring for a global inbox which could hold a mash-up of all email. This update would make for significantly better emailing on the iPhone. But does this mean you’d get the same newsletters twice in the same inbox? OS Themes – Plan on personalizing your phone to be as unique as you think you are. New themeing capabilitys are a shoe-in for this OS update. New iPad Features – Expect to see a lot of, if not all, iPad features included in this OS update. Such as the ability to read a book or read a book and listen to music, at the same time. Compass Upgrade (3GS only) – Rumor has it the compass feature will get an update… no one is sure what kind of update though. Secret Easter Eggs – As with the last 3.0 update, when several easter eggs were included, you will most likely see more easter eggs.